Rabbis and imams must be happy with these results. Proof that God does not hear the prayer of Christians. "In six U.S. hospitals, researchers involved in the Study of Therapeutic Effects of Intercessory Prayer (STEP) analyzed the healing effects of third-party prayer�in which individuals pray for a stranger whom they have never met. The study volunteers�about 1,800 heart patients undergoing bypass surgery�were randomly divided into three groups: members of the first two groups were not told definitively that they would receive prayer�one of these groups received prayer, and the other did not�while members of the third group were told they would certainly be prayed for. 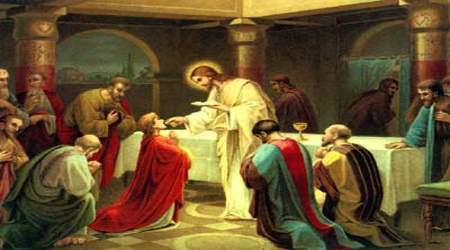 Daily prayers by three Christian groups began on the eve of the patients� surgeries and lasted for two weeks. The results? A tad, er, disheartening." Among the first group � who were prayed for but only told they might be � 52 per cent had post-surgical complications, compared with 51 per cent in the second group, who were not prayed for though told they might be. In the third group, who knew they were being prayed for, 59 per cent had complications. This week's Jew of the Week award goes to real estate tycoon and convicted felon Charles Kusher of New Jersey. Amy Klein reports in the Bergen Record that he has bargained down his two year sentence agreement for tax fraud by taking 500 hours of treatment for an imaginary drug problem. He will now be going from Alabama Federal prison to a halfway house in Newark where, we presume, he will resume running his business empire. And... instead of serving in prison until December or January as originally agreed, Charles effectively is out. NEWARK -- Real estate magnate Charles Kushner, who was convicted of campaign violations, tax violations and retaliating against a witness -- his sister -- has been transferred to a Newark halfway house and may begin working soon. Kushner arrived Friday at the Newark halfway house where he will spend five months, pulling up in a blue Cadillac De-Ville, The Star-Ledger reported Saturday. The millionaire developer started serving a two-year prison sentence less than a year ago, after being convicted of making illegal campaign contributions, cheating on his taxes and trying to retaliate against his sister after she helped authorities make their case against him. By completing a 500-hour drug and alcohol treatment program while he was at the Federal Prison Camp in Alabama, Kushner was able to cut at least four months from his prison term and qualified for a transfer to the halfway house. Prosecutors were outraged at the early release and tried to keep Kushner at the Alabama prison while they investigated whether he or others had lied to get him into the treatment program. While at the halfway house, Kushner must work, and he is expected back at his Florham Park real estate management company as early as next week. As long as Kushner goes to work and meets other requirements, he is allowed to request furloughs to spend weekends at home. If he exhibits good behavior, he could be fully freed from federal custody by August. Well done Charles! 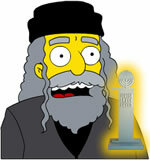 You truly deserve the prestigious tzvee.blog Jew-of-the-Week Award. 'It is very important that these toys do not remain intact so as to remove the element of idolatry,' said Eliyahu. His son, Shmuel Eliyahu, himself a rabbi in the northern town of Safed, said that it was inappropriate to own statues or dolls, even to play with or for artistic purposes. 'They need to be amputated or at least altered,' he said. Shmuel revealed that his father had forced one of his followers to snap off the ear of a replica of a statue of Moses by Michelangelo that he had bought at an exorbitant price. The city of Jerusalem may make the Western Wall accessible by cable car. Quoting a municipal source, Yediot Achronot reported Wednesday that there is preliminary approval for a plan to erect a cable-car network linking the Old City�s Wall Plaza with a station on the far side of the Hinnom Valley, half a mile away. The project, estimated to cost $5 million to $8 million, aims to relieve congestion on the roads and walkways leading to Judaism�s holiest shrine, according to Yediot. The Western Wall draws capacity crowds of hundreds of thousands of worshipers during the High Holidays. 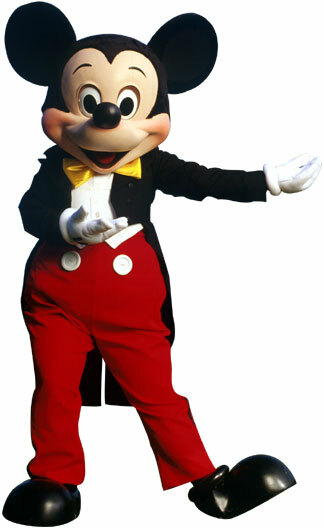 My question: When you get off the cable car at the Magic Kingdom of the Western Wall of the Old City of Jerusalem, will you be greeted by a giant hasidic mouse with his hands stretched out for a donation? JERUSALEM (Reuters) - An outbreak of deadly bird flu in Israel is God's punishment for calls in election ads to legalise gay marriages, according to Rabbi David Basri, a prominent sage preaching Kabbalah or Jewish mysticism. 'The Bible says that God punishes depravity first through plagues against animals and then in people,' Basri said in a religious edict quoted by his son. Basri said he hoped the deaths of hundreds of thousands of turkeys and chickens would help atone for what he called the sins of left-wing Israeli political parties, the son, Rabbi Yitzhak Basri, told Reuters, a week before a national election. The bird flu outbreak stemmed from far-left political parties 'strengthening and encouraging homosexuality,' Rabbi Basri's son quoted him as saying. One of the parties aired an election commercial depicting two brides kissing. Some campaign advertisements also called for homosexual marriages to be legalised in Israel. Basri is a prominent Kabbalist and author of commentaries on the Zohar, the main Kabbalah mystical text." Barak points out to me in an email that in an editorial today in the Washington Post -- What We've Gained In 3 Years in Iraq -- Secretary of Defense Rumsfeld concludes, "Turning our backs on postwar Iraq today would be the modern equivalent of handing postwar Germany back to the Nazis." 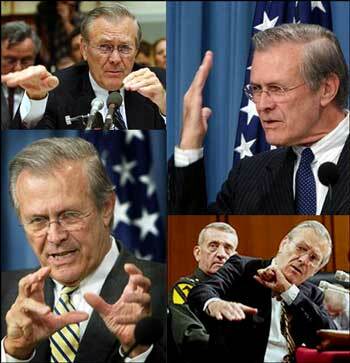 So by dint of his invoking GRNA, Rumsfeld has acted -- like it or not -- to conclude the debate over Iraq. Yes it is true. Rabbi Matisyohu Solomon and Rabbi Aaron Moshe Schechter and a third rabbi spoke at the Bnai Yeshurun synagogue in Teaneck on Sunday. I have read accounts of the lectures. It is said that all three are right wing rabbis and pro-Torah. 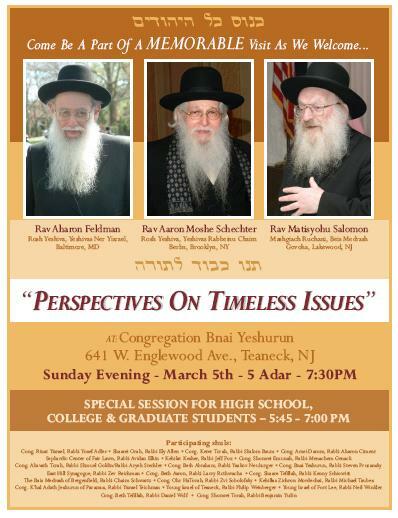 All three are against Western Culture, against Zionism and, various blogs claim as follows: Rabbi Aharon Feldman - against science; Rabbi Aaron Moshe Schechter - against science; Rabbi Matisyohu Solomon - against science. The closing ceremony must take place in the stadium after the end of all the events. The flag bearers of the participating delegations and the name-board-bearers enter the stadium in single file. Behind them march the athletes, without distinction of nationality. The flag bearers then form a semi-circle behind the rostrum. The President of the IOC and the President of the OCOG mount the rostrum. To the sounds of the Greek national anthem, the Greek flag is hoisted on the flagpole that stands to the right of the central flagpole used for the winners' flags. The flag of the host country is then hoisted on the central flagpole, while its anthem is played. Finally, the flag of the host country of the next Olympic Games is hoisted on the lefthand flagpole to the strains of its anthem. The mayor of the host city joins the President of the IOC on the rostrum and returns to him the Olympic flag. The president of the IOC then entrusts it to the mayor of the host city of the following Olympic Games. This flag must be displayed in the latter city's main municipal building. World's Largest Havdalah Candle? Chabad Inspired? "I declare the Games of the ... Olympiad closed and, in accordance with tradition, I call upon the youth of the world to assemble four years from now at ... to celebrate with us there the Games of the ... Olympiad". A fanfare then sounds; the Olympic flame is extinguished, and while the Olympic anthem is being played, the Olympic flag is slowly lowered from the flagpole and, unfurled horizontally, carried out of the arena, followed by the flag bearers. A farewell song resounds.